Rent The St. Anthony | Corporate Events | Wedding Locations, Event Spaces and Party Venues. The St. Anthony offers elegant and beautiful settings within our exquisitely restored ballrooms. The magnificent French Chandeliers in Peacock Alley greet you upon arrival and take your breath away. From cattlemen to oil barons, U.S. Presidents to airline executives, business leaders have been gathering at The St. Anthony for their most important meetings for over a century. Our 15 flexible rooms encompass 31,527 sq. ft. of indoor and outdoor meeting space. Each space retains their timeless elegance and individual character – from double-height ceilings to walnut paneling to crystal chandeliers – while offering the latest audio-visual equipment, lighting and connectivity. Our excellent service, from our culinary and service staff to our on-site technology staff, ensures that every detail is attended to and your guests enjoy a productive and successful gathering. The St. Anthony has hosted the finest San Antonio weddings for over one hundred years. And now, the heritage continues in spaces that have been completely renovated to blend timeless glamor with modern conveniences. Whether you’re planning an intimate gathering or a grand gala for hundreds, our exceptional staff will attend to every detail, leaving you free to revel in the joy of the moment. With nearly 4,700 square feet and capacity for up to 400 seated in rounds, the historic two-story ballroom was added to the hotel in the 1940’s and is beautifully appointed with exquisite crystal chandeliers and dual staircases that overlook the room. Also featured is a 12’x20’ built in stage with theatrical lighting. French doors lead into the adjoining Peraux Ballroom. The Peraux Ballroom features 14 foot ceilings and classic chandeliers. The focal point of the room is the 19th Century French tapestry loomed by famed artist Lionel Peraux. The 1,978 square foot ballroom seats 120 for a ceremony and 150 for dinner. French doors lead into the adjoining Anacacho Ballroom. Chic chandeliers, beautiful wood detailing and rich, damask wall coverings provide a sophisticated look for the Draper Room. The 2,296 square foot ballroom seats up to classroom for 80 and dinner for 150. 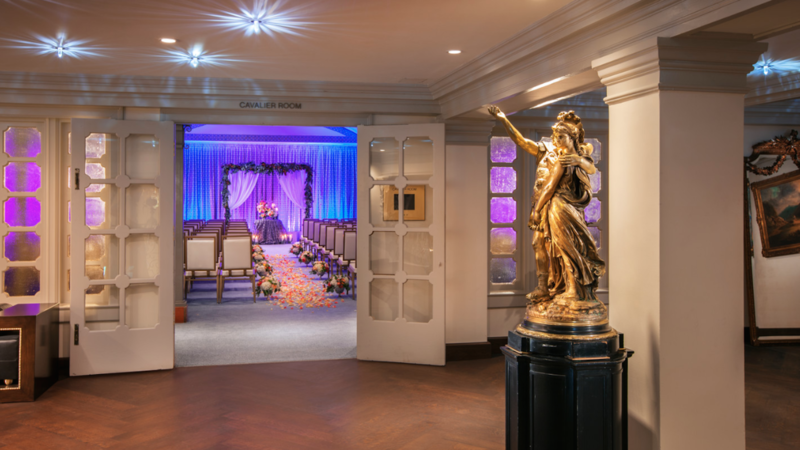 Named for the Texas Cavaliers, a charitable organization supporting the children of San Antonio and founded here in 1937, the Cavalier Room sits atop the grand marble staircase on the hotel’s mezzanine level. With a distinct dome ceiling, gleaming terrazzo floors, and mosaic tile wainscoting, the 1,998 square foot ballroom seats up to classroom for 80 and dinner for 100.